Difference between revisions of "Failed Politician Slaughters Mayor and Supervisor--and the Cops Cheer Him On!" Moscone Slain! 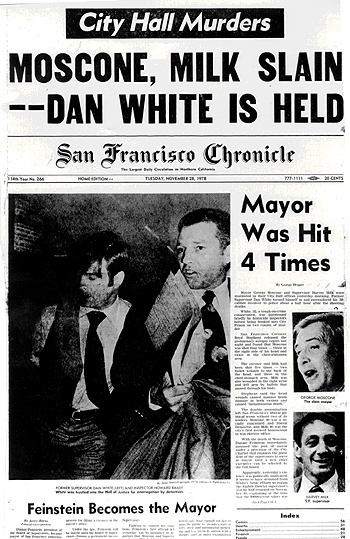 front page of the San Francisco Chronicle announcing the killings of Mayor Moscone and supervisor Harvey Milk. City Hall, Van Ness and McAllister. Nov. 27, 1978: Former Supervisor Dan White crawled through the soil testing lab window (McAllister Street side) with a loaded gun, avoiding the metal detectors at the main entrances. A security guard saw him, but, recognizing White as a politician, allowed him to pass unsearched. (Why the label politician inspired such trust remains a mystery...) After his surreptitious entrance, White went upstairs to Mayor George Moscone's office. White had a grudge against the mayor; after resigning as supervisor on account of financial hardship, White suddenly decided he wanted his old job back, and Moscone wasn't about to give it to him. The mayor poured two drinks of White Horse and offered one to White, asking him whether White was planning to go back to work at the Fire Department, and offering to help out if his family needed financial assistance. White listened for a while, then suddenly stood up, thrust his pistol at Moscone's chest, and fired. The mayor fell to the floor; White bent over him and fired again into his shoulder. Then, straddling Moscone's fallen body, White methodically pressed the gun against the mayor's ear and, execution-style, fired two shots into the spot that professional assassins know is always fatal. White then headed for the supervisors' offices and let himself through the back entrance with a borrowed key. Seeing Supervisor Harvey Milk, he said Harvey, can I speak to you for a minute? Sure, Milk replied, following White into the ex-supervisor's former office. White unleashed a tirade of verbal abuse, swiftly followed by a bullet to the gut, another to the chest, a third into the back, and a fourth into the skull. As Milk lay dying, White bent over, placed the pistol against Milk's head, and fired yet another professional-assassin-style insurance round. When news of the killings reached police headquarters at the Hall of Justice, wild cheering broke out among San Francisco's finest, a great many of whom detested the liberal mayor and gay supervisor. An inspector who heard the howls of celebration was mystified; it sounded like San Francisco had just won the World Series or the Super Bowl, he thought, but the Series was over and the Super Bowl was months away. Later, while serving his couple of years in jail, White would be treated like royalty by the cops and prison guards who ran the joint. The building where this bizarre political slaying occurred is one of the nation's premier examples of French Renaissance Revival architecture. The monumental design recalls, and was in fact modeled after, the Hotel des Invalides in Paris, constructed by glory-hungry Louis XIV, who hoped that the magnificent building would contribute to his everlasting fame. Unfortunately for Louis, another glory-hungry tyrant named Napoleon was entombed in Les Invalides, so nowadays everybody thinks of Napoleon instead of Louis when they visit the Right Bank's most magnificent edifice. Getting back to San Francisco's City Hall, it does seem ironic that a copy of the world's most famous piece of monumental political architecture, designed to commemorate the wisdom and everlasting glory of magnificent statesmen, should be the scene of one of the most ludicrous and grotesque political assassinations of all time. You can witness an odd, surreally beautiful scene every weekday after 1 p.m. here at City Hall. At the top of the first flight of marble stairs, people get married, one after another, in a mass ceremony overseen by the City of San Francisco. Actually, it's a beautiful location for a wedding. One of America's most famous marriages took place here: On January 15, 1954, Joe DiMaggio married Marilyn Monroe.